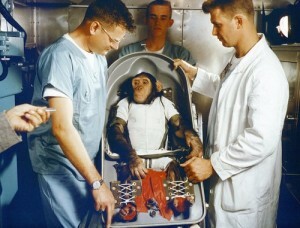 50 years ago today, Ham the Chimp travels into outer space aboard Mercury-Redstone 2. Ham (whom was named this only after he survived the flight) was the first ape to fly into space. Note that apes include chimpanzees, gorillas, and humans, but NOT monkeys.